Katherine recently attended Tidal Twinings 2009, the annual Fall basketry retreat of the Columbia Basin Basketry Guild held in Lincoln City, Oregon. 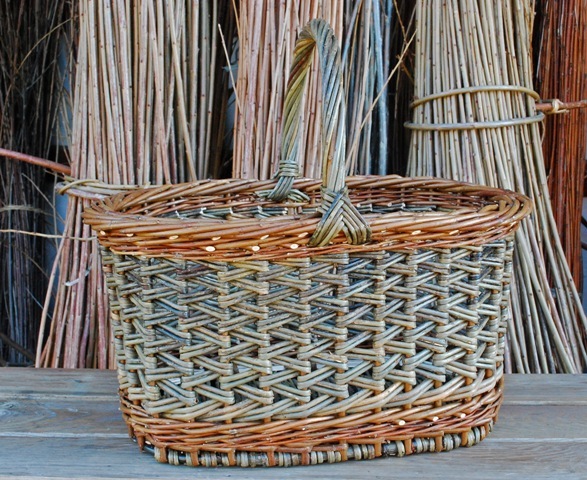 She taught two classes: a one day round fruit or bread basket and a two day zig zag weave willow shopper class. She says that the weavers seem to enjoy the classes and completed some nice baskets. What did she bring back for me? Photos to crop, tweak, and upload into a couple of photo albums which you can view by following the links below. This entry was posted in basketry and tagged basketmaker, baskets, Columbia Basin Basketry Guild, Katherine Lewis, Tidal Twinings, willow baskets by Steve@DunbarGardens. Bookmark the permalink.